I do not agree with the 1/4 inch layering for several reasons. First, I believe the potential for cold joints can occur between layers. Second, the possibility of a mason being able to place his thumb back into a 3/8 inch mortar joint cut one inch in depth is not practical. And, third, I do not believe the process adds any benefit for the long-term durability and performance of the new mortar in exchange for the added cost factor to repoint a building three times as compared to one. 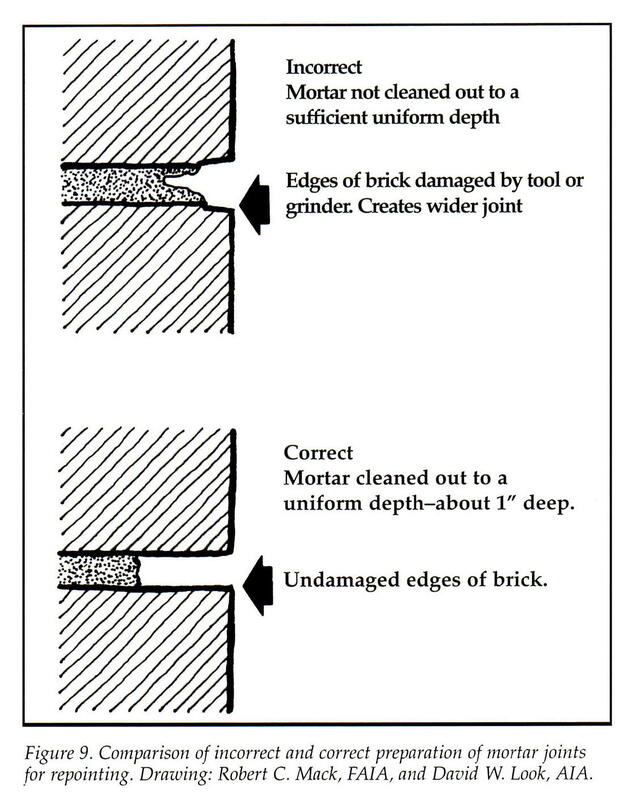 That being said, I understand the PB2 authors point to establish methods to minimize shrinkage cracks as the mortar hardens – which this process likely does – if the mortar formulation is not correct, let me explain. Our experience has been that most shrinkage cracks occur within the first 16 hrs after placement due to three primary reasons: 1) excess water in the mortar material; 2) the incorrect aggregate gradation in the mixture – generally the sand is not coarse enough for the width of the joint – the wider the joint the courser the particles need to be, or; 3) early evaporation of water from the joint causing a flash-set to occur. While we do specify repointing in lifts if the joint depth is greater than 1-1/4 inches. In this case, place the mortar in 3/4 inch layers, but this is generally not in every location. In most projects there is the occasional deep pocket or void but this is generally not a typical condition everywhere on the building. If you are getting into areas of two inches or more it time to re-lay the brick. This entry was posted on November 4, 2011, 11:00 am and is filed under Uncategorized. You can follow any responses to this entry through RSS 2.0. You can leave a response, or trackback from your own site. Great topic John! Thanks for sharing! We (BIA) changed our Technical Note 46 several years ago to say that the joints should be packed in lifts, but that only the last outer layer be required to become thumbprint hard before tooling. Prior to that we mirrored the NPS recommendation. I say to leave it up the to (experienced) mason to make sure that the joint is full no matter how the mortar is installed. In a few square feet point the mortar in the first pass, by the time you start the second pointing mortar from first pass is still plastic, by the time you start the third pointing the second pointing is still plastic. You have to adjust how many square feet you take on in a given period according to the wind and temperture. I use a spray bottle to moisten as needed or needed. I was taught by the best , my recently departed Uncle Paul Nix , and Henry Nix as an apprentice out of Atlanta in the mid seventies. Back when people were not so greedy and people took pride in their work . I totally disagree with you on repointing in one lift. In my opinion, the art of proper tuckpointing has been lost in many areas of this country and I wish there were more masons that took pride in their work like William. First, the cost for repointing is not 3 times as much. I have had this argument several times with contractors. The mortar removal (i.e. grinding) is between 1/2 and 2/3 the square foot cost of repointing. The installation of mortar is minor in overall comparison. Second, if a mason is repointing in an area they can install the lifts in a relatively short time frame and should not wait until the mortar has cured enough to create cold joints. The point of 3 lifts is to make sure the mortar is well compacted in the joint without voids. Lastly, I have seen a number of projects where one lift repointing was done and voids are left within the joint and the joint was not well packed. This allows more water penetration. Repointing in one lift does not leave any room for error. I’m not saying it cannot be done in one lift and won’t test out similar in a lab situation, but when you factor a site and masons installing this in the field on a historic building it has been my experience that you will get a much poorer product for a minor cost difference. If a mason charges you 3 times as much for 3 lifts, then I’d say you are being overcharged. Masons are craftsman and should be tought the proper techniques and I feel information like this waters down the art of proper repointing. Brett, Thanks for your position on re-pointing in lifts. I agree with you that the labor cost in wall preparation in removing mortar is more in comparison to labor cost of installing the material. We have had the benefit of evaluating over one thousand masons installing re-pointing mortar in every possible masonry unit both new and historic. What we have found is that voids are generally created when re-pointing mortar is mixed with too much water – not allowing the material to be compacted back into the joint with efficiency. In addition, we also have noticed that when masons use older tuckpointers (not sharpened into a square tip at the end) or the tool is simply the wrong size in relation to the width of the joint (many tools are too wide for the narrow joints they attempt to fill) forcing the mason to turn his tool sideways to get the mortar material back into the joint often creating a void space. All masons should have the opportunity to provide the best possible workmanship and execute the re-pointing work with the most appropriate tool and mortar material prepared to the correct consistency. work stand out. The caulking craft is even one of more importance and demands total consistency, as even one inch of failure is not acceptable. I hope everyone had a Merry Christmas and a safe journey home. Happy New Year. What do you when there is nothing left to the original joint. I have a house built in 1850. The foundation is made up of large granite blocks ~12in X 24in X 24in with the joints being ~24 inches deep. In some areas all of the existing mortar is gone and I can reach back to the soil in the back of the blocks. The foundation itself is still very solid as you could expect with blocks that big. What do you do in a situation like this? Repointing in small layers seems impractical and almost impossible when you cannot see through to the back of the joint. Rob, Thanks for your message. You can certainly repoint the deep joints using a coat hanger to reach the back of the joint. I would pack the mortar in one inch lifts. I trust this helps. Mix the mortar to brown sugar consistency for compaction.